When Will I Get My Tri Fold Newsletters? 5,000 and under Tri Fold Newsletters: Ships or ready for pick up in 2 business days from proof approval. Over 5,000 Tri Fold Newsletters: Ships or ready for pick up in 5 business days from proof approval. 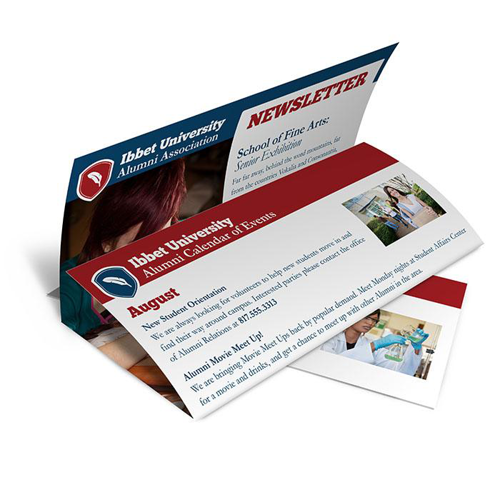 Tri-fold newsletter printing completes a design triple play! Order tri-fold newsletter printing from 48HourPrint.com and you will feel lucky -- sort of like winning the trifecta! With our online newsletter printing services, you get high quality tri-fold newsletter printing and more for your money. And you also enjoy the benefit of our industry-leading 48 Hour Turnaround Time Guarantee for quantities of 5,000 or fewer newsletters. Tri-fold newsletter printing gives you at least triple the layout options. With three panels on each side available for compelling images and copy, you can really put your creative ideas to work! Limit visuals and text to one panel or spread them out across two or three panels. It’s your chance to be creative as you design a tri-fold newsletter that can be mailed, fit into a pocket, or handed out. Tri-fold newsletter printing can help you build your brand in fun ways! In addition to our single fold newsletter printing services, you can also choose from no fold newsletter printing, single fold newsletter printing, double parallel fold newsletter printing, accordion fold newsletter printing, french fold newsletter printing, roll fold newsletter printing, and gate fold newsletter printing.